2. Half the potatoes and add to boiling water until tender. 3. Add diced onion, garlic, and 1 tsbp Earth’s Finest Coconut oil to sauté pan on medium heat. 4. Transfer potatoes to sauté pan. 5. 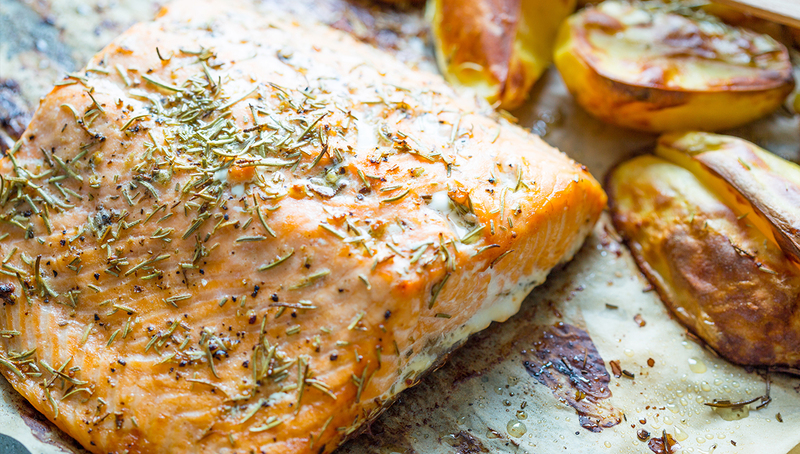 Prepare salmon on baking sheet by pouring warmed coconut oil over each side of fillet. 6. Salt and pepper salmon and then bake for 10-15 minutes or until warm pink center. 7. Finish potatoes with rosemary, salt, and pepper. 8. Serve salmon and potatoes, along with a favorite green veggie if you wish.